You’ll find you’re using the Oki C5450 more and more as the Oki C5450 is so incredibly easy to use and efficient too. Producing great quality prints is what the Oki C 5450 does best, but constantly using your C-5450 can cost a lot of money. A lot of Oki C5450 toner accessories are available at a high price-just compare Oki C-5450 cartridge prices amongst leading Oki C5450 suppliers to find out. We at CartridgeSAVE, however, are dedicated to finding you cheap C-5450 toner cartridges-and we want to ensure you’re happy with the Oki C5450 toner that you get. We provide you with great service when you buy Oki C5450 cartridges so that you know for sure that you’ll be satisfied with the Oki C5450 toner cartridge you receive. Our great service gives you great value for money when you buy the Oki C-5450 toner-try us and find out! Don’t forget that every Oki C 5450 toner cartridge comes with free delivery so that you receive your Oki C5450 cartridge with as little stress as possible. The C 5450 toner also comes with a money back guarantee which allows you to order the Oki C 5450 toner cartridge with confidence, knowing that you’ll receive a great Oki C5450 cartridge no matter what. Affordable, versatile, and well designed are the best words to describe the Oki C5450 printer. This affordable choice also boasts low running costs, thanks to its high yielding toner cartridges. 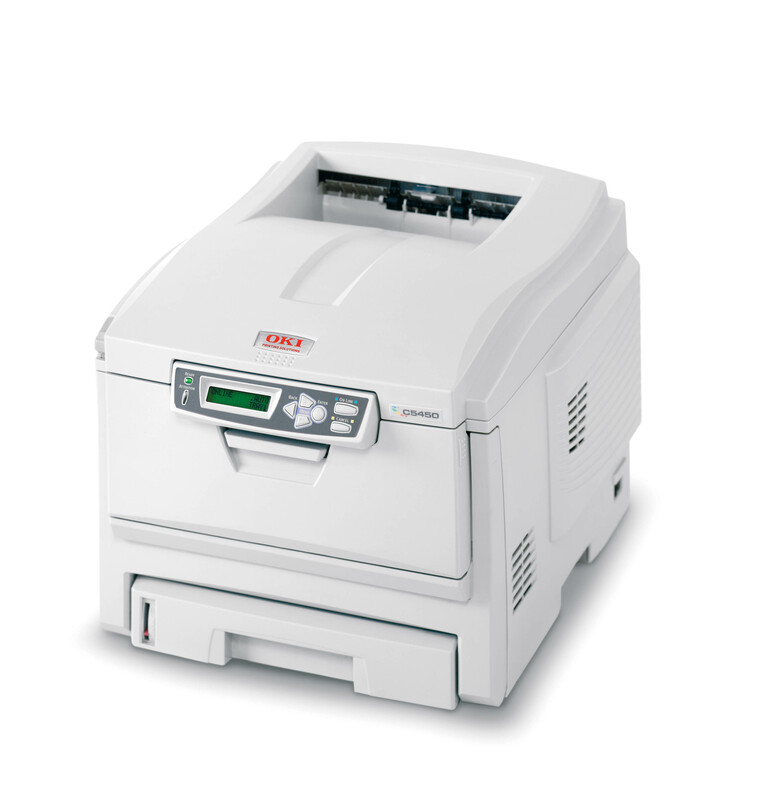 The Oki C5450 LED laser printer is a good choice for growing businesses and offices, featuring upgrades like networking and automatic duplexing. However, these upgrades for the C5450 cost extra but they are well worth it when the business truly calls for such functions. Photo quality is lacking, but can be improved by using quality photo paper. The Oki C5450 LED colour printer still sports the same design as previous versions of the series. It has a backlit LCD screen, intuitive control panel, and a standard USB interface, while optional upgrades are available, including the auto duplexer and network interface. The Oki C5450 even comes with a 128 MB internal memory and a 400 MHz processor, which keep operation smooth. The C5450 colour laser printer features a straight paper path instead of a curved path, which reduces the risk of paper feed problems like paper jams. In addition to its upgradeable features, the Oki C5450 colour laser boasts affordability not only when it comes to its upfront cost, but in terms of running costs as well. The device uses affordable consumables, which keep cost of ownership very low. In particular, some suppliers offer cheaper aftermarket compatible toner cartridges for the Oki C5450 which are significantly less expensive to buy than the genuine Oki C5450 toners. The unit is also capable of high-volume printing. However, the Oki C-5450 does not offer top-notch prints, especially when it comes to graphics and images. Colours are sometimes inaccurate. Print speeds are below par, at 24 ppm (black and white) and 16 ppm (colour).